Historians consider the Coliseum to be the finest architectural achievement in the history of the Roman Empire. The Coliseum is also known as the Flavian Amphitheater, because it was constructed during the reigns of the Imperial Roman Flavian Dynasty emperors Vespian and Titus. It was Vespian's desire to build a stadium of such magnitude that no one would question Rome's power. Vespian chose an elliptical shaped theater similar to the theater in the city of Curio. He would not live to see its completion. 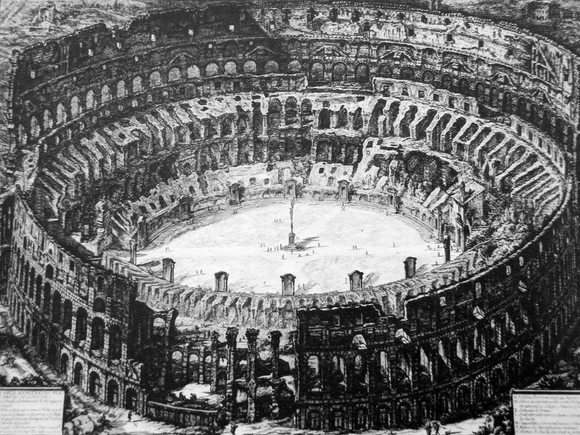 Construction on the Coliseum began between the years 72-75 A.D. It was completed in 81 A.D. under the reign of Domitian. Domitian added many features including sub-levels that featured trap doors for scenery changes. He also added drains for the production of naval shows and sea fights. One other surprising feature that was added was the vomitoria. The vomitoria was a room for those who had had too much to drink or eat. The Coliseum was built to accommodate 50,000 people. The seating is tiered, on slopping concrete columns that remind us of the way stadiums are constructed today. It is 600 feet long, and it is 500 feet wide. The outer walls stand 157 feet high. Seats came in four different sections. The section closest to the action was reserved for the senators, tribunes, and members of the Equestrian Order. The next two sections were reserved for the citizens. The top section, farthest away from the action was for the lower classes and women. Every ticket was clearly marked with a row, seat, and entrance number which corresponded with an arch. There were a number of entrances that were reserved for dignitaries. Any Roman citizen who wanted to see events in the Coliseum had plenty of opportunities. The inaugural gladiator event lasted 100 days. The Roman calendar was full of official holidays. During the 4th century as many as 175 events a year were being held. Two of the most popular events involved animals and staged sea battles that involved lots of theatrical scenery and architectural devices. The animal cages were arranged so that large groups of carnivorous animals could be led into the arena at the same time. Most of the time, the people who fought were professionally trained fighters who had attended schools to learn how to fight. Many of the gladiators were slaves who had been sold for the purpose of fighting. Because they were slaves they had to be constantly guarded to avoid escaping. Sometimes, they didn't want to fight. As a result, they were burned with a red hot iron or whipped until they change their minds. 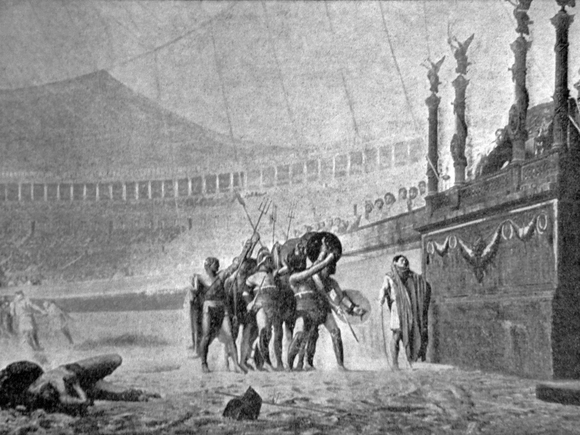 Chariot races were conducted in the Circus Maximus, which held 150,000 people. The chariots were pulled by 2, 3, or 4 horses. These races were not as bloody as the wild beasts events, or the gladiator events, but the crashes made them extremely popular. Many charioteers died as a result of being run over. Gladiators also entered the fighting arena on a chariot. However, they fought hand to hand combat until someone died. After casting lots, which was like flipping a coin, the games began. Gladiators fought with swords, shields, nets, and spears. If they were wounded, to the point that mortality was certain, a man called a Charon would come into the arena and ferry him to the next world.